Reasons why you are reporting: Denying a Ban Appeal without any reasoning or explanation . I got told by few people on discord that I should make an appeal because Blacnova said he didn't care and it was unfair . They told me that I needed to make an appeal "to be formal" So I made a meme appeal because I thought people already agreed it was unfair and the guy who banned me also said it . The only reason I can think of on why Doc denied it , is that he didn't check the replies and only looked at the meme appeal . If you check the replies you can see people saying why it was wrong because some of the mods took it seriously , but Piklas resumed it pretty well you can see in the screenshot down bellow . If he actually read the replies and still denied it , I think this is just a really bad decision from an Admin AND there was no explanation what so ever . Really unprofessional , I understand that you're in need of staff because of Wilmer but don't choose randomly . If I misunderstood your denial Doc , I apologize for saying that but I can't see any other reason on why you denied it . I don't know you Zek and never paid any attention to what you did. I understand you have a lot of friends on the server. I was the one who recommended you make a ban appeal, because that's what everyone has to do to be unbanned. I don't know you well so I wouldn't feel comfortable unbanning you on site not knowing the whole story, then you give us this appeal full of lies (remind you, I have NO IDEA who you are). I also want to point out whatever influence you have on a select group of friends right now that are rallying to get you unbanned has them acting very toxic towards staff, which does not help in your favor. You can thank them for the response you received on your ban appeal. They really gave you a bad rap if you ask me..
Doc was a fun staff, and yet better a Lovely member of the community, he was joyful and really chill, even though we had our issues between us but I really did respect him. Either Doc is experiencing Real Life issues or internet issues, he changed he became more strict and somewhat of an unprofessional staff member. After all, the staff represents the server, they're the face of the community and they should act more mature and professional. I'm not here to defend my actions, or any rule breaking behavior, I'm just here to offer a solution, an idea! to further improve the server's reputation and even better; satisfy the current community members! Doc has been more aggressive towards other players, I think it's an issue and it can be solved with love and care. This is my opinion after all, you may agree or disagree with me, but this is how I see the server and I really love it and willing to improve it. I haven't been contacted by Zek or any of his supposed "friends" it's just me giving my own opinion, which should be valued as a member's experience. I personally don't know Zek, but all I've seen from him that he's a very chill guy, and he might joke around a bit, but that's all, I don't think him being banned is necessary. He just adds more to it. (01-20-2019, 03:49 AM)rubik Wrote: I don't know you Zek and never paid any attention to what you did. I understand you have a lot of friends on the server. I was the one who recommended you make a ban appeal, because that's what everyone has to do to be unbanned. I don't know you well so I wouldn't feel comfortable unbanning you on site not knowing the whole story, then you give us this appeal full of lies (remind you, I have NO IDEA who you are). I also want to point out whatever influence you have on a select group of friends right now that are rallying to get you unbanned has them acting very toxic towards staff, which does not help in your favor. You can thank them for the response you received on your ban appeal. They really gave you a bad rap if you ask me.. Lies ? What are you talking about , please tell me which lies I said ? Also I never talked them into doing anything they did it on their free will don't count me in that . Also why are you putting emphasis on the fact that you don't know me ? Like I care if you know me lol ? Nothing that I said was a lie and you did nothing to provide any assistance to this than saying "I've rallied some kids to be toxic to staff" Which is false and a bad argument. Also proves that you have nothing against what I did . Know me or not is not the problem . If you want to know the full context ask blacknova he's going to say the same thing . All right, so, first off, Jacket's response is retarded. We yell at people for being minors in nsfw channel and revoke that role all the time. heck, people've even gotten banned for it. Second off, our Discord is not a secondhand account trading platform. Please don't use it as such. Third, we don't really care about Blacnova's opinion around here, they don't play on our server. Now then, I don't think what you did needs a daggone permaban from the Discord or whatever you got, from what I can tell, you've been banned for months(? ), but, honestly, a lot of people have just been telling me you're toxic, and they don't actually want you unbanned anyway, just like Butcher. So, if you're a toxic minge on the Discord, and you got banned for something legitimate before, and no one wants you unbanned anyway, I don't really see any reason to unban you. Now, regarding Doc posting a meme denial on your thread, well, you're the one who made a meme original post, and your thread was filled with meme response from unrelated players. It's not really fair of you to complain when an admin then denies and closes your meme thread in a meme manner. (01-20-2019, 03:57 AM)plutori Wrote: All right, so, first off, Jacket's response is retarded. We yell at people for being minors in nsfw channel and revoke that role all the time. heck, people've even gotten banned for it. 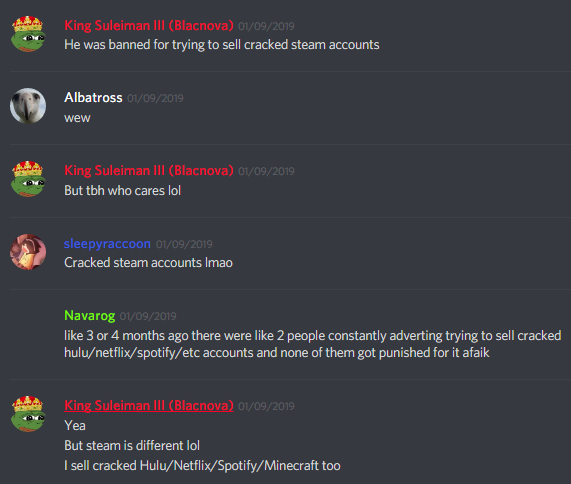 Second off, our Discord is not a secondhand account trading platform. Please don't use it as such. Third, we don't really care about Blacnova's opinion around here, they don't play on our server. Jacket response was rational , if the majority of the server is under 18 , it should be deleted . It's not because you revoke some kids permission that you're in the right . Second of all , you don't decide what people can do on discord trade or socialize isn't your business , also I had no warning to stop , if someone would of warned me I would of stopped 100% . I just got insta banned . Again , CAN YOU STOP THE F'ING ALLEGATIONS OF ME BEING TOXIC , if you can't back it up don't post your OPINION . I'm not toxic and you can CTLR+F any of my conversation on discord . You also have Staff friends who can't take a joke and tells you that i'm toxic but when people I know say that i'm not toxic you just ignore them ? Total bias . Last of all , did you even read what I said ? If you're about to deny something read the replies first , if he didn't read them than reread them and do a proper denial or accept it . Zek you took my response way out of context. All I'm saying is I don't know you and that's why when I was asked to unban you I said to make an appeal. Then I was called a bunch of names in General by your "friends" which obviously swayed my opinion of you. Now you're jumping to conclusions when I'm just trying to explain my side the best way I know how. In reguards to the "lies" I mean the fact that you said you were selling/adverting pornhub accounts in your app appeal , then in a response you said it was a joke that we're all supposed to understand? Please just be serious about this and don't waste our time is all I'm saying. You make a meme ban appeal and get upset when I deny it? That's pure logic. Put effort into your appeal and maybe I'll consider accepting it. (01-20-2019, 04:08 AM)Doc McStubbins Wrote: You make a meme ban appeal and get upset when I deny it? That's pure logic. Put effort into your appeal and maybe I'll consider accepting it. I'm going to have to go with this. I'm allowing you to repost a serious ban appeal, but this current report is denied. If you want to make meme threads, you will receive meme responses. If you want a serious discussion, please make a serious thread.